I love learning about alternative healing methods. In the last 12 years, I have read, studied and used several healing remedies, such as homeopathy, osteopathy, chiropractic, kinaesthetic massage and natural herbal remedies, with real and lasting benefits for me and my family (even my sceptic hubby). In view of this, I was eager to review The Alternative Medicine Cabinet. This small book of 150 pages gives a basic overview of alternative ways to take care of your health naturally. Most of the information in this book is not new to me, but it is a good reminder of good health practices and how to take care of oneself because, ultimately, we are responsible for our own health. I really enjoyed learning about the Bach Flower Essences and it sparked my interest to learn more. The chapter An Herbal Overview was practical since Gruver tells how to make your own herbal tincture and capsules. And the reminders in Be Your Own Advocate cannot be stressed enough. 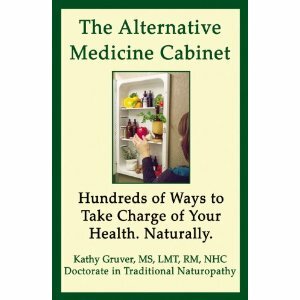 If you want a good introduction to natural health care, this book will give it to you since Gruver covers many topics. However, if you’re looking for a more in depth study of alternate healing solutions, you may be disappointed. The title led me to believe that I would find more detailed information that I could put into practice immediately without having to do more research. In some cases the information is practical, such as the herbal formula you can make for lowering high blood pressure, but in others, the information is really general. For example, under the heading Homeopathy for Children, a list of the most common remedies and their best uses could have been included so that a parent could try them. Or when the author suggests 5-HTP for depression and obesity (excellent choice), the reader might wonder about the dosage, how to take the remedy and how it works as opposed to traditional anti-depressants and diet pills. I also felt this book needed more rigorous editing. Some of the info was repetitive, and the author’s tone was at times too informal, such as when she wishes the reader good luck almost after every chapter (I don’t know what luck has do with it) or when, during the last part of the book, she self-praises her ability to heal super quick and insinuates that if you are not bouncing back to work a week after a back injury, you are not taking responsibility for “fixing” yourself. At this point, I felt her perspective came across somewhat unprofessionally, although this was not the case throughout the book. Overall, this book is a good introduction to alternative medicine. Disclosure: Thanks to Kathy Gruver and ReviewTheBook.com for sending me this book for review. I was not compensated in any other way, nor told how to rate or review this product. What a terrific book! I've struggled with Chronic Lyme Disease for 4 years and have treated it naturopathically for about 3. I love studying about natural healing methods too. Thanks for sharing this review!! I am interested in more natural healing choices and this sounds like a good beginner book. Interesting article. Regarding herbs - I've been using them myself for a longer period of time, and I can say that they can actually treat and prevent many diseases for which most people would use pharmaceutical products. Fortunately, there are healthier alternatives.